After years of steady declines, McDonald’s is turning around sales. The fast-food chain has been making a ton of changes, such as launching all-day breakfast, swapping out margarine for butter, and adding new value options like the McPick 2 deals to drive traffic. The efforts are proving to be successful: McDonald’s sales at restaurants open at least a year jumped 6.2% globally, including a 5.4% increase in the US, in the most recent quarter. Quarterly profit rose 35% over the previous year. But a recent survey by the American Customer Satisfaction Index (ACSI) shows McDonald’s still has a long way to go in one area: public perception. 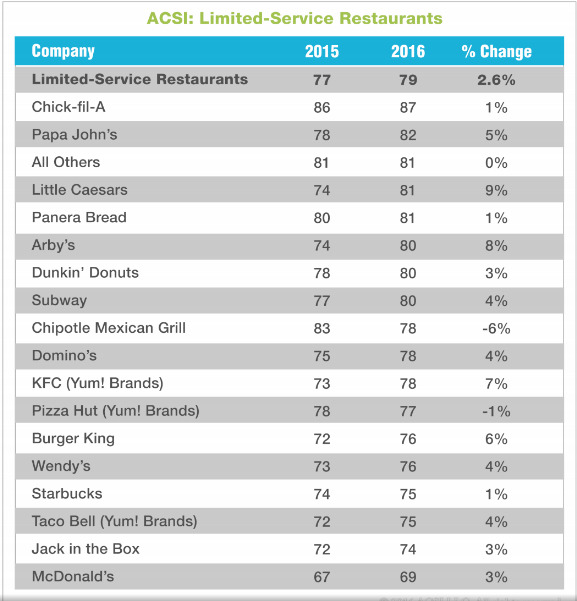 The fast-food chain ranked in last place in ACSI’s 2016 Restaurant Report, with a customer satisfaction score of 69 out of 100. The last-place ranking remains unchanged from last year, but the company’s score did show signs of improvement. “While McDonald’s remains in last place at 69, the fast food giant gains 3% from a year ago primarily on the strength of its new all-day breakfast menu,” the report says. Chick-fil-A ranked in first place in the survey with a score of 87, followed by Papa John’s with a score of 82. Chipotle, meanwhile, dropped seven spots this year to No. 9 from its second-place ranking last year, following an E. coli outbreak at its restaurants in 14 states. 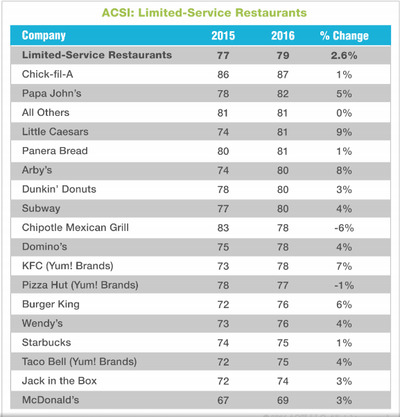 The ACSI report is based on interviews with 4,786 customers who were asked to evaluate their recent experiences with the largest fast-food restaurants in the US in terms of market share, plus an aggregate category consisting of “all other” restaurants. Customers are asked to rate items like order accuracy, friendliness of staff, food quality, and restaurant cleanliness.